I've been missing in action, eh? Not about to miss Trash 2 Treasure Tuesday, however! Check her out if you are in need of refreshing a shower curtain, throw pillows, or drapes! At over three thousand sales and a five star rating, Sew Panache can be trusted for top quality items. So much to blog about, so little time. Hence not having a single post to share last week! My Dad and Mom came up to help the progress along and thankfully my mom is staying an extra week. What have we been working on? Painting the stairway, fixing up Tobin's bathroom, painting Tori's bathroom, painting the living room, decorating the family room, adding length to curtains, lots more - none of which are completely finished projects, I'm sad to say! Oh, did I mentioned tearing down the old well, tearing the old shingles off one of the shed's and replacing it with a metal roof, tearing the rotten ceiling out of the garage and cleaning up some major eye sores outside. Phew. And mom is trying to convince me we need to work until midnight tonight. Sorry mom. You may have twenty-two years on me, but your body must be younger than mine. Just can't do it! Slave driver. For reals. 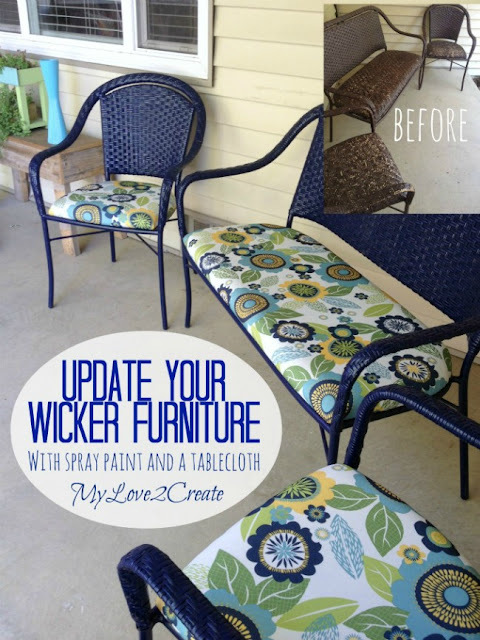 My Love 2 Create took a tired out ole' wicker set and breathed beautiful new life into it! Now this just really tickled my fancy. 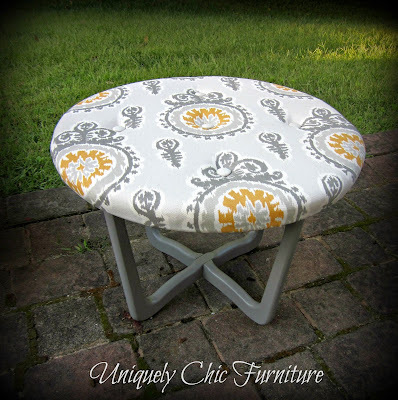 Uniquely Chic Furniture turned a short little table into an adorable tufted ottoman. Swell! Thanks for the super fun party Kammy. I am loving looking at all the work going on with you guys right now. Brings back memories. Have a great week, and keep us updated on the progress. We LOVE it. Hi Kammy, I met Sarah through your last Tuesday Trash to Treasure and spent a happy hour reading all her posts. Nice to meet others. So glad you host Trash to Treasures. Thanks for a great party, Kammy. That ottoman is adorable! Thanks for hosting the party Kammy!